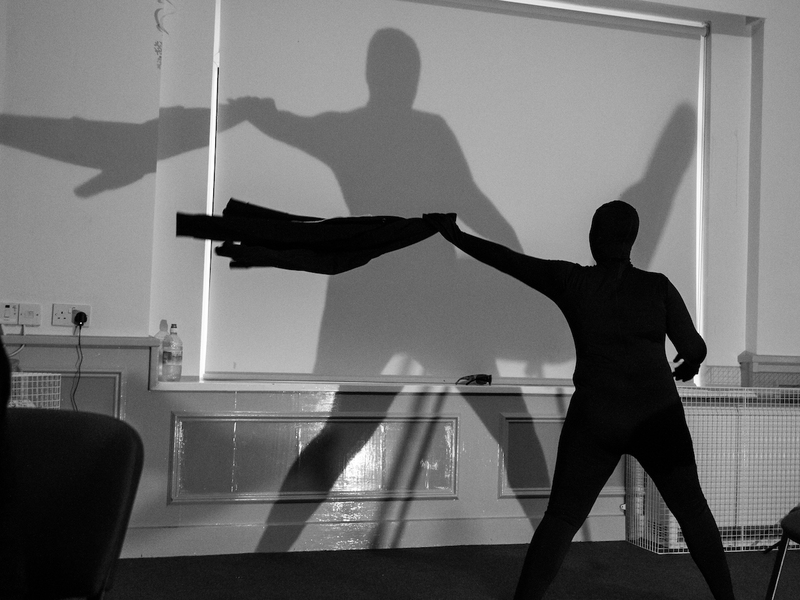 You are in Home / News / Shadow Girl – the city streets performance day! In 2015 Greater Manchester Police recorded the UK’s 2nd highest rate of hate crime – with the number of disability motivated crimes more than doubling since 2014. 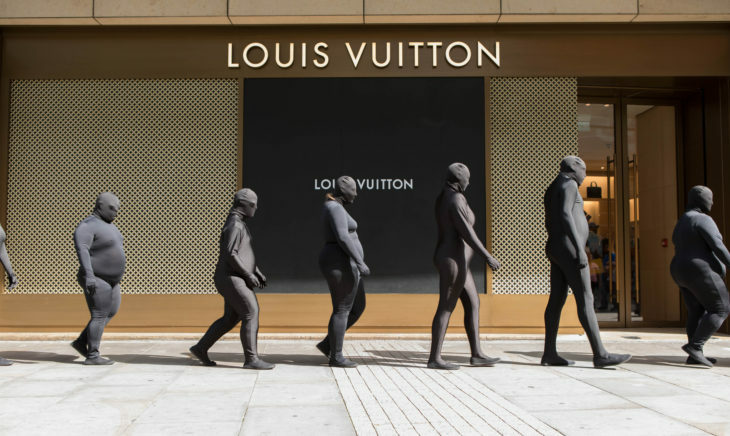 Shadow Girl – the city streets is a response to this, aiming to make people living with disability labels more visible on our streets… And yesterday, we did just that. Danielle: What a great day it’s been, all the hard work leading up has really paid off. It was such a great piece to be part of. 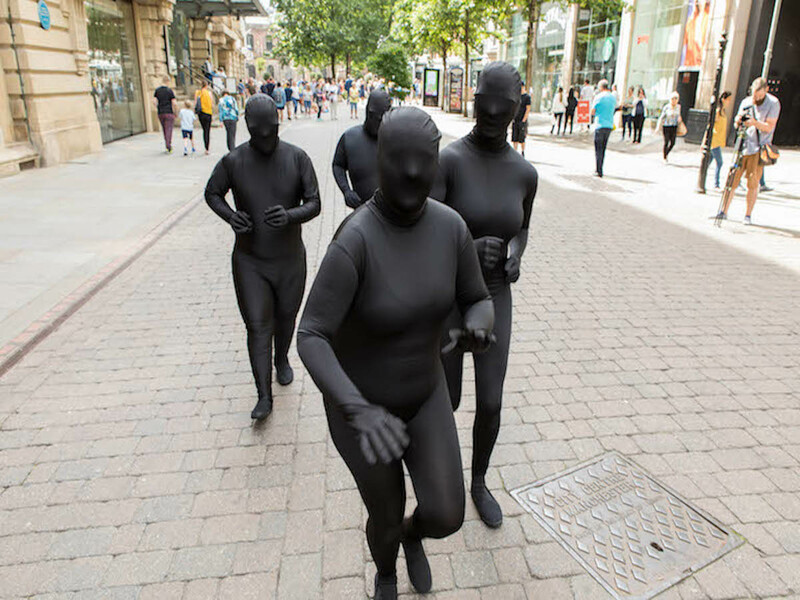 If you’d have asked me a few months ago, I never would have imagined even attempting to wear a morph-suit, let alone wearing it on the streets of Manchester in front of hundreds of people! It was great to see the reactions of the unsuspecting public as we wandered around causing mischief. It’s amazing to think that not that long ago, ‘Shadow Girl’ was just an idea and now Chrissy has taken it above and beyond all our expectations and has today taken over Manchester City Centre. Thank you Chrissy for letting us be part of your incredible project. Amy (a performer from DIY Theatre) – I thought it was Fantastic and I really enjoyed doing it with you all at Proud and Loud Arts. I was not nervous at all. Thank you for letting me do it with you. Kelly: Well wow, what can I say about today? It’s been absolutely amazing from start to finish but I think amazing doesn’t even come close to how such an incredible, creative group of artists can produce such excellent outstanding performances. Even when we were all really hot, sweaty and tired not once did we ever think of stopping because it was such great fun and the audiences were loving us, we just wanted to carry on. I personally could have gone again I really had such a super time. Thank you Chrissy Jones for allowing us to be part of your work. You did amazing and I can’t wait for next time. Chrissy – I really enjoyed everyone being part of this project and seeing others performing it. It was very good and it definitely stood out. We’re all looking forward to Tuesday’s rehearsal where we can share stories, pictures and videos, reflecting on our fun in Manchester, but for now, we shall revel in our greatness, you are free to revel too! Photo Credit: All images captured by Carl Gibson – Thank you for chasing our shadows across Manchester. Make sure to keep up to date with all that we are up on Facebook, Twitter, Instagram and YouTube, this conversation has only just begun.